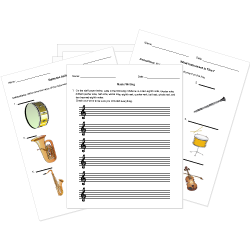 You can create printable tests and worksheets from these Grade 9 Chords questions! Select one or more questions using the checkboxes above each question. Then click the add selected questions to a test button before moving to another page. If the root of a triad is D, the 5th is the note . A triad consists of a , a , and a . If the 3rd of a triad is A, the root is the note . If the root of a triad is B, the 5th is the note F# . What is the V chord in the key of F#? The C7 chord is spelled C, E, G, Bb. The VII chord is also known as the . The F7 chord is spelled out F, A , C, Eb . The V chord is not one of the primary chords. What is the II chord most commonly called? In a major key, primary triads are always minor triads. The VI chord is also known as the . The IV chord is not a primary chord. In a V7 chord, you can omit the 3rd and it will still count/sound as a V7 chord. A chord is a group of three or more notes played or sung together to make harmony.